Synopsis: Following their reunion in The Muppets, a business manager named Domonic Badguy (Ricky Gervais, and pronounced "Baajee") convinces the Muppets to hire him for a world tour. In reality, Badguy is the #2 associate to "the most dangerous frog in the world" named Constantine - a perfect doppelgänger to Kermit with the exception of a well-placed mole. When Constantine escapes prison he switches places with Kermit so he and Domonic can steal the Crown Jewels and frame it on the Muppets. Andrew: Hello readers! So last night had a nice little dinner-and-a-movie date and saw Muppets Most Wanted, the sequel to 2011's The Muppets. This one is a direct sequel to the previous film, I mean it literally picks up where the other one left off. This time without the involvement of Jason Segel and Amy Adams, however. It was directed by the same director, James Bobin (Flight of the Concords), it was written by Bobin and Nicholas Stoller, who wrote the first one with Jason Segel; and the music was all done by Bret McKenzie, who also did all the music for the first one and even won the Best Original Song Academy Award for "Man or Muppet." So a lot of the same talent came back and obviously all the Muppets came back. Muppets Most Wanted involves a relatively simple plot where Kermit lookalike Constantine, the most evil frog in the world, busts out of a Siberian Gulag and switches places with Kermit in order to steal the Crown Jewels with his #2 man, Dominic Badguy (Gervais), who has replaced Kermit as the Muppets' business manager. So easy-peasy plot but overall, what do you think Sarah? Sarah: Let me first start out by saying that this was one that I really didn’t care if we saw in theaters or not. I liked the first one but it was a kids movie so it wasn’t like, “Yeah! We need to see this one!” But we wanted to catch a movie before I head out of town for the weekend so we decided to see this one as it seemed a little light-hearted. And I really, REALLY enjoyed this one! Actually, I liked this one better than the first one! A: I agree with you on that! S: The music was fantastic, and in my opinion was better. I felt like they hit their stride with this one. And it was definitely more Muppet focused than the first one. Nothing wrong with Jason Segel and Amy Adams, I like them and think they did a fine job in the first one. But this one focuses back on what the Muppets were originally, which was a Kermit and crew focused show, so I really liked that we were back to that. The cameos were better in this one, the locations were fun, you still had some of the same gags but they were the good gags that are staples to the Muppets. I just really liked this one! I laughed a lot! What did you think? A: I mean, I completely agree with you. I liked The Muppets for what it was. I thought it was a good way to bring the Muppets back into the public consciousness. But this was a better Muppet movie. As you said it was more...not just Kermit-based but Muppet-focused. I mean on the whole crew: Fozzie, Miss Piggy, etc. And Walter, who was introduced in the last film, took a bit of a back seat here which was fine with me. S: Animal takes a little bit of a bigger part in this one, too. I mean, it’s truly Muppet-focused which I really liked. A: And not only is it Muppet-focused but it’s more their humor. The Muppets had their humor too, obviously, but it seemed more focused on Walter and Segel's Gary and their interactions with the Muppets, whereas this one had more jokes that seemed straight out of the old show. A: Laughing a number of times. And I loved the music. Some songs more than others but there was a particularly stretch of three songs: "I’m Number One," "The Big House," and then Constantine sings this very Michael Jackson-esque song, "I’ll Get You What You Want," that were all fantastic. Very catchy and Ricky Gervias and Tina Fey sang quite admirably in "I'm Number One" and "The Big House" respectively. 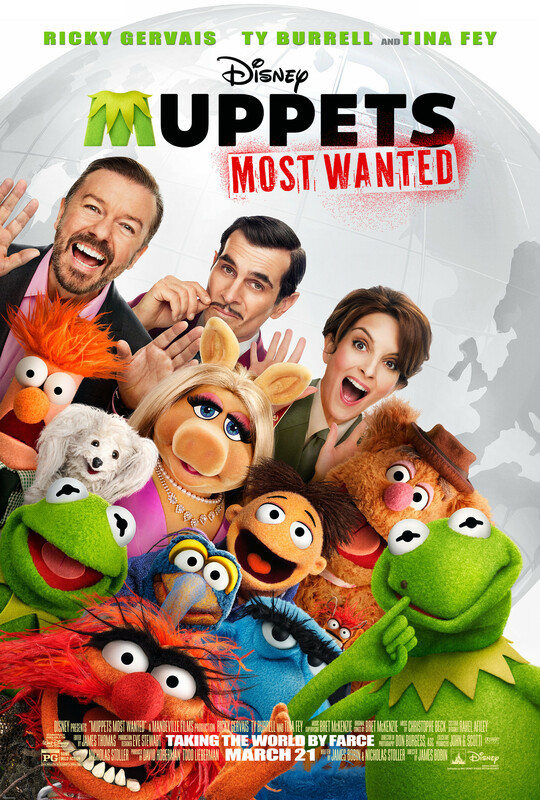 Muppets Most Wanted is nothing complex and the plot is what it is, but it was just fun! And that’s what we were hoping for. S: It’s just good old-fashioned family fun but you throw in the cameos and the one-liners that will go over kid’s heads to keep the adults laughing, because the adults are the ones who originally watched the shows to begin with. They knew who the Muppets were to begin with. So there’s a whole generation that hasn’t known what the Muppets are and I think this was a great example of the comedy and the fun that they can bring to screen. A: Yeah, this would be a good one for parents to take their kids to. Especially if they have seen The Muppets. Let’s talk about the cameos real quick, because there were A LOT of them. S: A LOT ! And they were better this time than they were in the last one. A: There’s actually a difference, too, between some famous actors that had relatively sizable roles in this film and a cameo in its truest sense. I mean, you had Tina Fey, Ricky Gervais and Ty Burrell who were the big three, but Danny Trejo, Ray Liotta and Jemaine Clement all had relatively sizable roles as prisoners in the Gulag. S: And they were the true definition of cameos. Celine Dion had a pretty big role as Miss Piggy’s fairy godmother. And there were whole host of others that we won’t spoil for you because they were truly a treat. A: There were a couple that went to waste, that I wish they had been a bigger part of the movie but that’s what the cameos are for. S: It does. I think people are trying to compare it to the first one and, it’s not. It’s fun, much more fun, I think, than the first one. And at a time when a bunch of serious movies are starting to come out for the year, this is one that is needed to be light-hearted. And there’s a REALLY funny short at the beginning of the movie! A: Oh man, I totally forgot about that! S: We’re not going to ruin that surprise, because that was a little treat that we didn’t even know about. A: I mean, you can go and look it up on the Internet if you really want to know, but it really was a pleasant surprise. S: Alright, so what would you give this one? A: I’m going to give this one a 4! S: I would actually go ahead and give this one a 4 ½! It hit all it’s marks and really had us laughing the whole time. FINAL VERDICT: Definitely worth your time whether you're a Muppets diehard or not! 86th Academy Awards Full Predictions!